I spend at least two hours of every day on the TTC; it is a fundamental part of my Toronto life. 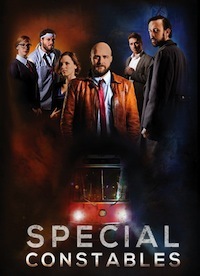 Now, you don’t have to be so intimately familiar with local transit to enjoy Special Constables, but if you have grown up with the Red Rocket and know its quirks as well as those of an annoying roommate, then Circlesnake Productions‘ latest show will be a transcendent experience. The Storefront Theatre space is an intimate strip of bare stage. I found myself staring across at the other audience members in much the same way I would my fellow passengers on the subway. And, during a few moments of audience participation, we became commuters on the TTC. In a clever bit of set dressing, yellow and green lines trace out the performance area in the pattern of the TTC subway system map. There is also some very inspired miming where the actors provide the sights and sounds TTC customers have come to know so well. The story is over-the-top, inspired by action-movie tropes—a criminal mastermind and his henchmen, a cop seeking redemption, a tough ex-wife, secret alliances, a conspiracy… you name it, this show’s got it! The story is distinctly Torontonian. Jameson is a former special constable whose reckless methods spelled the end of the titular unit. When a Metropass counterfeiting ring threatens to undermine the security of the TTC, he must secretly revive the special constables. What ensues is… pure genius! The script is a communal effort, developed through improv. To the creative team responsible for this brilliant show: bravo! It works perfectly as a send-up of Hollywood hokum and a tribute to all of the things we love and hate—and love to hate—about our TTC. It may even prove to be useful to the TTC in a most unexpected manner; the next time I find myself put out by a transit delay, my irritation will be assuaged by imagining that it was caused by the antics of these lovable special constables (like a thrilling streetcar chase tearing up downtown Toronto). Under the direction of Alec Toller, the pacing never lags! Never! I can’t recall even a single dull moment. The plot moves along at a brisk pace and the action is carefully planned to keep your eyes moving from one end of the stage to the other. The very talented actors—Conor Bradbury, Amy Kitz, Mikaela Dyke, Tim Walker, Colin Munch, and Chris Wilson—keep the energy up and never miss a beat. I am particularly impressed by how effectively this company combines all of the following: TTCisms, action movie clichés, goofy yet precise physical comedy, and a natural self-awareness that never feels too clever. I loved it—totally!—from start to finish. It was enormous fun. Go see it! Trust me: you’ll be chuckling to yourself on the subway ride home.